I am in our room at The Kevin here at Chautauqua awaiting Kate’s return from downstairs. Several things have happened in the past few days that suggest her very, short-term memory is rapidly going. She went downstairs about 20-25 minutes ago to get a piece of carrot cake left over from our lunch at the Italian Fisherman this past Saturday. I suspect she ran into our friends from Tom and is engaging in conversation with them. This is not a problem except that I know that she wanted to buy some tights because of the cold weather yesterday. We planned to go directly from our hotel to the Refectory for iced tea to which she has become addicted in recent years. Then we were going to the farmer’s market for a muffin or other breakfast treat. In 30 minutes it will be time for the Scott Roselle’s radio show during which he interviews the speaker of the morning. These are all things she wants to do, but I am sure she has forgotten that. Yesterday afternoon we stopped at several shops on the plaza. After coming out of one, she said she wanted to go in one more. Then we could go. I pointed out to her that she had already gone through that shop. She didn’t remember it at all and said she wanted to go through it again, and she did. I am always facing the dilemma of how or whether to call her attention to such things. It is hard not to do so because we are so conditioned to say, “You’ve already been there” or whatever seems natural. On the other hand, I fear that each time something like this occurs it makes her feel bad, and I don’t want that. I am trying not to fret. I attempt (frequently not successfully) to take a breath before answering and think of the right thing to say or whether or not to say anything. Perhaps with experience, I will get better. Another example occurred at dinner last night when told someone something and only minutes later Kate told her the same thing. We’ve had two really good days at Chautauqua, ones that remind us why we like coming here. I have the impression that Kate feels this even more than I. On the other hand, tonight I observed a behavior that I have seen before and that is a desire to simply relax and not attempt to do everything. That occurred this evening when we were at dinner here at the Kevin Hotel. She suggested that she thought I might be thinking the same thing that she was thinking. She didn’t say what it was, but I thought (correctly it turns out) that she did not want to go to the evening performance in the amphitheater but simply relax at the hotel. After dinner she asked if we couldn’t go out on the porch off our room and have a glass of wine. I said that would be fine, and I meant it. As it turns out, I had already decided that we would skip all or part of the evening performance. I thought that she did not know what the program was because we had not discussed it, but I now recall that our afternoon speaker, Justice Anthony Kennedy, had said that he was here for his granddaughter’ dance performance this evening. This notwithstanding I thought it was unusual that she just wanted to stay in tonight. This is something we have rarely done in all the previous times we have been here. The reason I even mention it is that I observe that Kate more frequently wants to retreat from social engagement than in the past. Of course, this could be something else. On the other hand, when I observe things like this, I always think of the possibility that it is related to Alzheimer’s. Perhaps this is another good reason that I think she is correct in not wanting others to know of her diagnosis. If they knew, they might be looking at everything as a function of Alzheimer’s. One thing I do know is that she has handled herself well socially. Tonight at dinner she was able to engage in conversation with those at the table with no difficulty at all. She was especially cordial to two Japanese guests that arrived today from Tokyo. We have also spent time with a couple from Tom. They have also introduced us to some of their friends, and Kate has handled the situations normally. Yesterday we arrived at Chautauqua (Chautauqua) after two nights in Niagara-on-the-Lake. For several years we have gone there before going to Chautauqua. From April through October they have the Shaw Festival that we both enjoy. They have a theater company that performs as many as 8-10 plays either by George Bernard Shaw or ones that are similar to his. We packed in a lot, seeing four plays in two days. They were all terrific. We love live theater, it was another of the very special times we continue to have. I continue to notice ways in which I need to take more responsibility. Kate came without any comfortable shoes and left some shoes, a jacket, a pair of slacks, and a few other things At our B&B. I notice a conflict between my wanting to take more responsibility and Kate’s wanting to feel independent. There are some things she appreciates – my taking care of, everything financial, some communications with friends, making arrangements for dinner and entertainment. There are also times she feels insulted by my efforts to help. Yesterday I showed her where the bookstore is and told her I would meet her there. She gave me a disgusted look and said she knew where the bookstore was. We have had a number of such things on the trip. 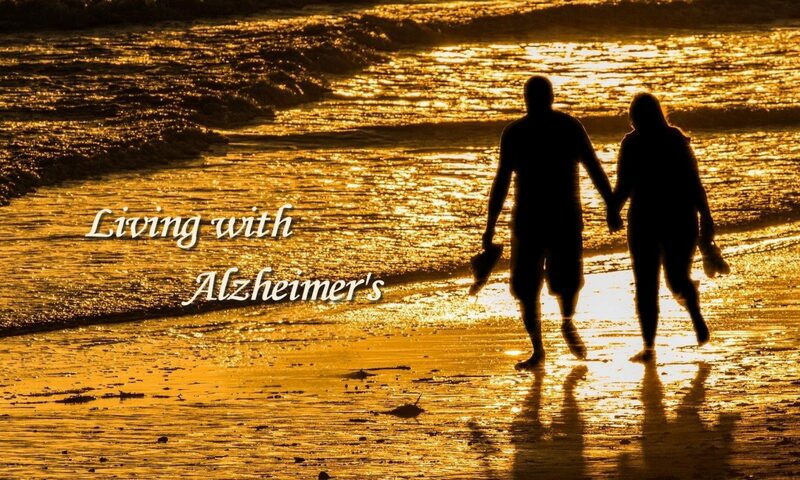 On the positive side, I still believe that we are fortunate that for everyday interaction with people that her long-term memory is still more than adequate for her to enjoy herself with others (most of the time) and to prevent their noticing that she has a memory problem. It is the short-term things that are most difficult for her. For example, we had a delightful conversation with two couples at our B&B in Niagara-on-the-Lake. A short time (perhaps, 2-3 hours) later she couldn’t remember them when I mentioned them to her. I explained, and she said she remembered. I know this is frustrating, even distressing, for her. She says little, but it shows in her face. I have often been critical of those who say that the person with AD does not know what is happening. I have a different perspective on this issue. My experience with Kate has reinforced this opinion. Clearly Kate knows she has AD, and she can see signs of it everywhere. On the other hand, I see her transitioning to a rather innocent, even child-like, stage that I don’t think she recognizes. One indication is that she very frequently remarks how intelligent people are. It often seems like she says this about most people she encounters. Another is that she is forever wanting to arrange to get together with people that we have not gotten together with before. She will even suggest inviting them to our house when I know that she will not remember to follow up on that desire nor will she be able to organize things for the event should I extend the invitation for her. Yesterday we got Kate a replacement driver’s license. This is the second time in two weeks that we have done so. We have now placed the driver’s license and her ATM card in a small change purse and put it in the storage area under the console between the two front seats. I hope this works. I know this has been hard on Kate. She has been stuck at home. Monday she was particularly cooped up. She was glad to have her license back for the psychological boost it gave her. One of the ways I notice she is down is that she pays no attention to dieting which she talks about for a few days and then goes off. While we were in Jackson Hole, she said she was going back to Weight Watchers as soon as we got home. She has made no effort to do so. She did take a stab at watching her diet a few days, but then gave in. I have not worried about this much since I feel that I want her to be able to enjoy herself as much as possible. It is so hard for her to do much nowadays. She continues to devote herself to the yard. I think this is because it is one thing she can do. Everything else requires more thought than she wants to give. She even asked me to answer an email from the treasurer of our neighborhood association. She had offered to reimburse Kate for the newsletter she distributed in May or early June. All Kate needed to do was tell her how much to pay. She asked me to write it for her. Before leaving for Dad’s yesterday afternoon, I could tell that she was down. I told her I would take her to dinner when I got home. I headed for a nearby Thai restaurant when she asked where I was taking her. When I told her, she didn’t react positively. I suggested another place, and she was happy about that. We went and had a good time as well as a good meal. It’s just that we spent more than we usually do for a weeknight dinner. Although someone might think we spend too much eating out, I feel that it is worth it. Before we started eating out for all our meals, I spent time preparing food by myself. Then I cleaned up by myself. Now we can spend that same amount of time together. Of course, I know that we won’t continue this forever. How long is the real question. I feel confident it could go on for more than a year and perhaps as long as 3-5 years. Dad has continued frequent calls yesterday and this morning. At 3:00 yesterday afternoon he called to say he didn’t know where he was and that his phone was not working. When I was there for dinner, I asked him about both of these things. With respect to not knowing where he was, he said, “”Oh, I knew where I was, I just didn’t know what else to say.” As for the phone, he told me that it said it was Tuesday, July 9. I told him that was correct. He said it hadn’t moved all day. This morning he called twice while I was at the Y. He said he didn’t know where he was but he was in a real nice restroom. It had bars on the wall that you could hold and everything. He went on to say that he was sitting on the side of his bed at Mountain Valley. I told him to stay there. I told him what time it was and that I would be there this afternoon. I got a call back in about 30 minutes. He asked if I were looking for him. I told him know. He said he was still in bed and that he was all right. I told him to stay there, and I would be there this afternoon. I can’t help noticing similarities between some of the things he does and those that Kate does. They both get confused and don’t like to be questioned for explanations. Kate regularly says, “Let’s not talk about it now.” Dad says almost exactly the same thing. We still have not found Kate’s driver’s license. That means I am driving her wherever she needs to go. This Thursday is her monthly PEO meeting. I know she would like to drive since she wants to take a neighbor with her this week. I am not optimistic about finding it before then. I got a couple of calls from him while I was at the Y this morning. He still did not know where he was and couldn’t find his call button. Dad has been going down and continues to have these periodic experiences in which he finds himself some place other than Mountain Valley. He is generally looking for help in getting him back where he belongs. Before leaving for Jackson Hole, Kate had misplaced her driver’s license, ATM card, Medicare card, and her supplemental insurance card. Last Friday we replaced her driver’s license and arranged for a new ATM card. I can’t recall how many ATM cards we have replaced. This morning as she was ready to leave for Lowe’s, she found that she had misplaced the driver’s license that we got on Friday. She has looked everywhere and continues to look, but no luck yet. It is most discouraging to her and to me. I am afraid I am going to have to take charge of these things .